The etiopathogenesis of osteoarthritis has been divided into 3 stages. In stage 1, proteolytic breakdown of the cartilage matrix occurs. Chondrocyte metabolism is affected, leading to an increased production of enzymes, which includes metalloproteinases (eg, collagenase, stromelysin) that destroy the cartilage matrix. Chondrocytes also produce protease inhibitors, including tissue inhibitors of metalloproteinases (TIMP) 1 and 2, but in amounts insufficient to counteract the proteolytic effect. Stage 2 involves the fibrillation and erosion of the cartilage surface, with a subsequent release of proteoglycan and collagen fragments into the synovial fluid. In stage 3, the breakdown products of cartilage induce a chronic inflammatory response in the synovium. Synovial macrophage production of metalloproteinases, as well as cytokines such as interleukin (IL) 1, tumor necrosis factor (TNF)-alpha, occurs. These can diffuse back into the cartilage and directly destroy tissue or stimulate chondrocytes to produce more metalloproteinases. Other proinflammatory molecules (eg, nitric oxide [NO], an inorganic free radical) may also be a factor in stage 3. Eventually, the above events alter the joint architecture, and compensatory bone overgrowth occurs in an attempt to stabilize the joint. As the joint architecture is changed and further mechanical and inflammatory stress occurs on the articular surfaces, the disease progresses unchecked. Go to Osteoarthritis for more information on this topic. Certain diseases are often categorized as subsets of primary osteoarthritis. 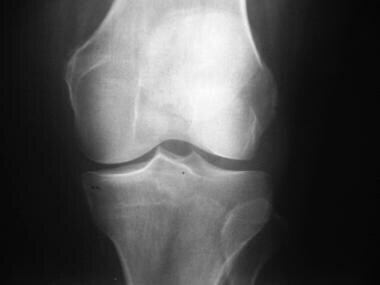 These include primary generalized osteoarthritis (PGOA), erosive osteoarthritis, and chondromalacia patellae. 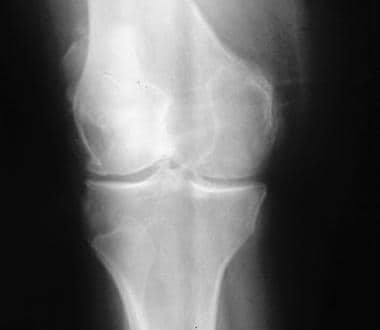 Erosive (ie, inflammatory) osteoarthritis is a form of primary osteoarthritis marked by a greater degree of inflammation, with erosive abnormalities and, in some cases, osseous ankylosis. The disease most commonly occurs in postmenopausal women, and it may be hereditary. Laboratory findings are generally uninformative. Close-up posteroanterior (PA) radiograph of the hand reveals narrowing and osteophytes affecting multiple interphalangeal joints. 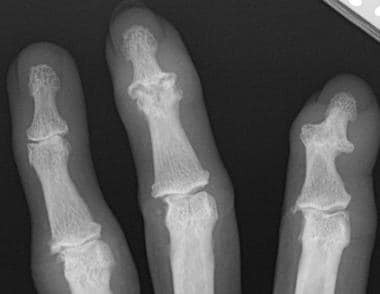 Note the "gull-wing" configuration of the distal interphalangeal joint of the middle finger due to central erosion. 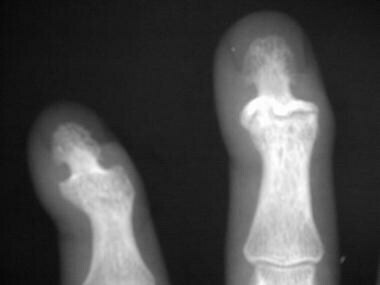 There is also ankylosis of the distal interphalangeal joint of the index finger. 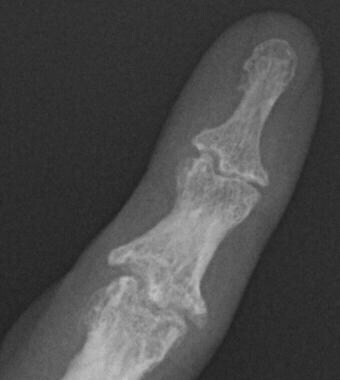 Close-up radiograph of the fifth digit shows osteophytes and central erosions resulting in a "gull wing" appearance. Close-up radiograph shows fusion of the distal interphalangeal (DIP) joint of the fifth finger; this finding is compatible with advanced erosive osteoarthritis. Chondromalacia patellae is a syndrome of crepitus and pain at the anterior knee that most commonly occurs in young adults. Conventional radiographs provide little information, and although arthrography enables a more direct assessment of cartilaginous integrity, many consider magnetic resonance imaging (MRI) to be the initial imaging study of choice. Chondromalacia patellae is associated with cartilaginous changes along the undersurface of the patella (see the following image). 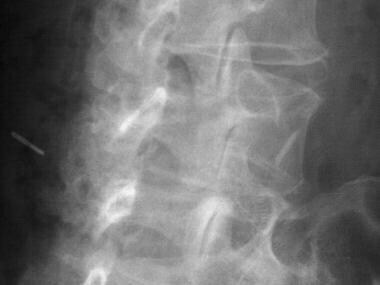 Oblique projection demonstrates gradual narrowing and sclerosis of the facet joints as one progresses down the lumbar spine. Several systems have been advocated for use in the grading of focal cartilage change; however, a simple description of the extent of disease (ie, surface, partial-thickness, or full-thickness irregularity with or without underlying subchondral bone change) is generally sufficient and prevents confusion that occurs with numeric grading systems. Radiographic findings may be normal in the early stages of the disease, because cartilage is not directly visualized. Eventually, cartilage loss manifests as joint-space narrowing. 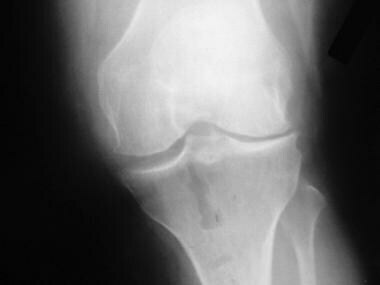 In patients with osteoarthritis not related to previous trauma, diffuse cartilaginous thinning is often noted; early in the disease, this affects the medial compartment more so than the lateral or patellofemoral compartments. Later, tricompartmental cartilaginous thinning may be appreciated (see the images below). 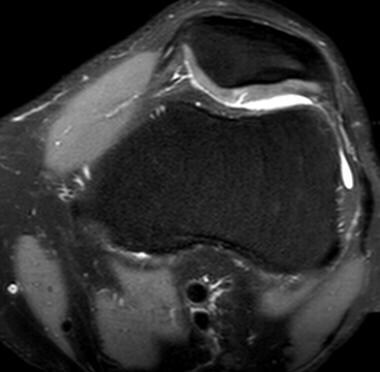 Transverse, fast spin-echo, T2-weighted, fat-saturated magnetic resonance imaging (MRI) scan of the knee reveals increased signal intensity within the articular cartilage of the patella reflecting degeneration. 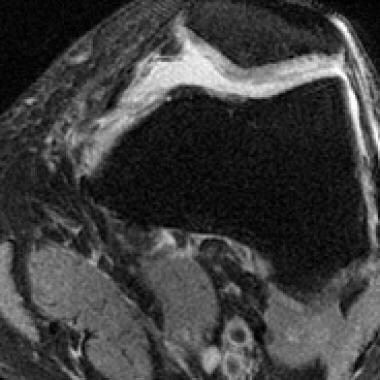 Transverse fat-suppressed fast spin-echo T2-weighted magnetic resonance image reveals a fissure of the patellar cartilage filling with joint fluid. 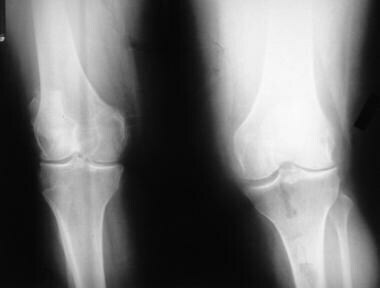 Examples of the radiographic grade of osteoarthritis according to this system are seen below. Osteoarthritis of the bilateral knees, Kellgren stage II. Osteoarthritis of the right knee, Kellgren stage II. 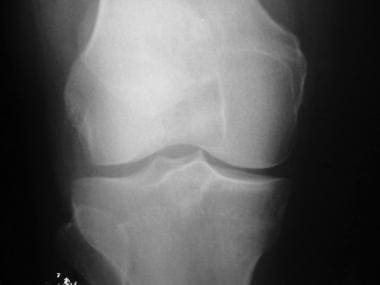 Osteoarthritis of the left knee, Kellgren stage II. 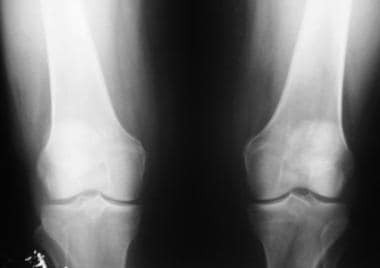 This radiograph demonstrates osteoarthritis of bilateral knees. Radiographic findings of osteoarthritis are often graded using the Kellgren-Lawrence Grading System. These knees would be classified as Kellgren grade III. KELLGREN JH, MOORE R. Generalized osteoarthritis and Heberden's nodes. Br Med J. 1952 Jan 26. 1(4751):181-7. [Medline]. [Full Text]. KELLGREN JH. Osteoarthrosis in patients and populations. Br Med J. 1961 Jul 1. 2(5243):1-6. [Medline]. [Full Text]. Cuperus N, van den Hout WB, Hoogeboom TJ, van den Hoogen FH, Vliet Vlieland TP, van den Ende CH. Cost-utility and cost-effectiveness analysis of face-to-face versus telephone-based non-pharmacological multidisciplinary treatment for patients with generalized osteoarthritis. Arthritis Care Res (Hoboken). 2015 Aug 28. 12 (4):433-43. [Medline]. Cuperus N, Mahler EA, Vliet Vlieland TP, Hoogeboom TJ, van den Ende CH. Measurement properties of the Health Assessment Questionnaire Disability Index for generalized osteoarthritis. Rheumatology (Oxford). 2015 May. 54 (5):821-6. [Medline]. McGonagle D, Hermann KG, Tan AL. Differentiation between osteoarthritis and psoriatic arthritis: implications for pathogenesis and treatment in the biologic therapy era. Rheumatology (Oxford). 2015 Jan. 54 (1):29-38. [Medline]. Belhorn LR, Hess EV. Erosive osteoarthritis. Semin Arthritis Rheum. 1993 Apr. 22(5):298-306. [Medline]. Kortekaas MC, Kwok WY, Reijnierse M, Stijnen T, Kloppenburg M. Inflammation is associated with erosive development in patients with hand osteoarthritis: A prospective ultrasonography study. Arthritis Rheumatol. 2015 Sep 28. [Medline]. OUTERBRIDGE RE. The etiology of chondromalacia patellae. J Bone Joint Surg Br. 1961 Nov. 43-B:752-7. [Medline]. [Full Text]. Standing radiograph of the knee reveals narrowing of the medial and lateral femorotibial compartments with marginal osteophytes. The authors and editors of eMedicine gratefully acknowledge the contributions of previous author Eli Steigelfest, MD, to the development and writing of the source article.